Take your meal to the next level and socialize with your friends over a pot of our delicious fondue creations tonight. 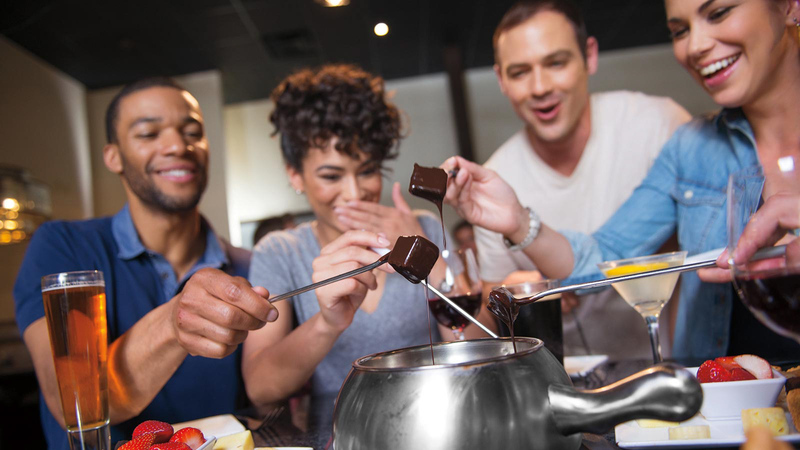 Enjoy a night out like never before when you and your friends indulge in cheese and chocolate at The Melting Pot in Atlanta. Perfect for any size party, our gourmet fondue restaurant has been delivering delicious interactive dining options for more than seven years. Celebrate birthdays, anniversaries, or just because with equal style when you reserve one of our tables for your small group or large party. No matter what you decide to celebrate tonight, we will have a table ready for you! The Melting Pot is the perfect destination for date night for you and your special someone. We remain a yearly recipient of the Wine Spectator's Award of Excellence, and we have been voted one of the “Top 10 Most Romantic" restaurants in Atlanta. Experience an intimate evening with the one you love in our semi-private booths tonight, and enjoy our wide selection of drinks and fondue creations. To schedule your special event please call 404.389.0099 or click here to email our special events coordinator. To order yours today, simply call 404-489-0099 to speak with our Hospitality Specialist!